On 9 May 2014 some important changes to the Spanish traffic laws came into effect. Whether you are hiring a car as a run-about while on holiday or are taking your own vehicle on a European road trip, there are a few things that you should be aware of while driving in Spain. I warn you that the following information may seem a little bit dry and officious, but please don’t let that put you off. By car really is a great way to discover the country especially if you want to travel at your own pace, count as many road-side Osbourne Bulls as you can, and get into the nooks and crannies that your average bus tour wouldn’t reach. Click on the red links to skip to relevant sections. If, however, you are in need of some light relief take a look at our rather more tongue-in-cheek take on driving in Spain on the GranadaSpain blog 7 Rookie Mistakes you don’t want to make on Spanish roads. Vehicles from the UK may be imported into Spain for up to 6 months in any 12 month period. If you are permanently importing your car to Spain don’t forget to inform the DVCL or you may find that they are still after you for UK road tax. You must be aged 18 or over to ride or drive in Spain and if you are planning to rent a vehicle you must be at least 21. Please also bear in mind that some hire companies may stipulate that you need to have been licenced for a minimum of one or two years. Licences issued in EU or EEA states are accepted. Visiting motorists from other countries will require an International Driver’s License. * Reflective jackets for driver and passengers – you may be fined if you not wearing one while outside your vehicle on the hard shoulder. * Headlamp beam deflectors or manually adjusted beams. Residents importing right-hand drives from the UK will have to purchase new headlights in order to pass the ITV (MOT equivalent). * Carry a spare set of light bulbs and tools to fit them – according the the RAC this is no longer compulsory, however, it is advisable to do so unless you fancy arguing the toss with the Guardia Civil or Trafico police. * Front and rear seatbelts are compulsory in all private vehicles manufactured after 15th June 1992. * Crash helmets are mandatory for riders of mopeds, motorcycles, trikes and quads (unless equipped with seat belts) and motorcycles must have their lights on at all times when on the road. * Cyclists under the age of 16 must wear safety helmets failure to comply could lead to fines for parents. * Talking on a mobile phone is prohibited while driving, unless you use a hands-free system. * Car radios and mobile phones must be switched off while re-fueling. * A reflective jacket must be used when getting out of the car on the road or the hard shoulder. * Warning triangles must be deployed if the vehicle has stopped on the road or hard shoulder. 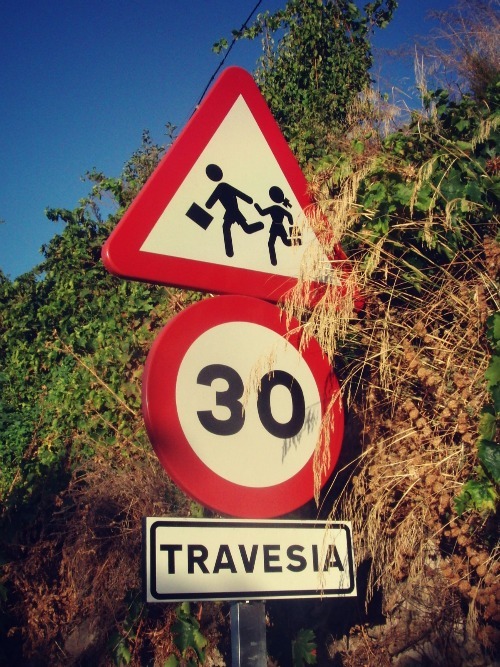 Travesia means crossing. Not to be confused with traviesa which means naughty. Above sign surely means naughty children crossing? It is prohibited to carry children in your arms. Children under three must travel in the rear using an approved car seat appropriate for their weight and height. This applies to travelling in taxis as well. Under the new law it is now prohibited for children under 1.35 meters to travel in the front passenger seat. The exceptions to this are when all the back seats are already taken up by other children, also under the height limit, or the car has no back seats at all. In the later case children under the age of 12 may only sitting in the front must be secured in a seat approved for this purpose. Failure to comply may lead to heavy fines and even confiscation of your vehicle. Please note that speeding fines can be applied even if you only exceed the limit by 1kph and that speed camera detectors and jammers are strictly prohibited and subject to fines. Overtaking can only be done on the left side of the car which you wish to pass and when there is a broken white line. Always indicate when pulling out to overtake and when pulling back in. Outside built-up areas drivers of cars and motorcycles may exceed the limit by 20 kph to overtake a slower vehicle on roads with one lane in each direction. In urban areas use of your horn is prohibited except in an emergency. Use your lights instead. I suspect that nobody has informed the pan man of this particular rule, unless of course we count bread delivery as an emergency. Watch out for variable speed limits on the motorway and be aware that radar speed traps are common. The legal blood alcohol limit for drivers and cyclists in Spain is 0.5 g/l (0.25 mg/l in exhaled air). The penalty for drink driving may be a one to four year suspension, and a possible prison sentence of six months to one year. If you are caught driving with blood alcohol level double the legal limit you will be subject to a minimum of €1000. This is immediately doubled if you get caught twice in the same year. After a traffic accident, all road users involved are required to take a breath test. Anyone suspected of being under the influence of alcohol or drugs, or who has committed a traffic violation must undergo a breath test for alcohol or a saliva test for drugs. Police may confiscate the vehicle of drivers who refuse to be tested. 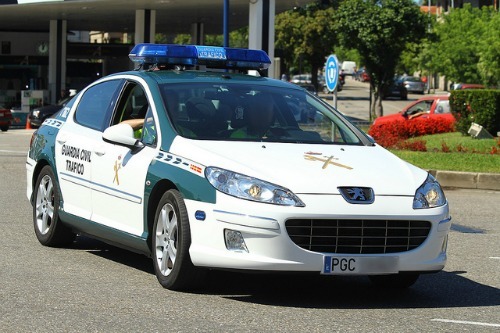 The Spanish Traffic Police – Guardia Civil Trafico in green and white marked cars – have the power to impose fines on the spot and the new laws mean that they can observe an offence and take down the car registration without having the stop the vehicle. And in the case of visitor’s driving their own cars in Spain, offences will then be reported to the country where the car in registered. For residents there is a 15 day period during which you can contest a fine. For minor offences, if you pay within 20 days you can get it reduced by 50%. If you are a visiting motorist are also entitled to the 50% reduction but must pay fines immediately to the officer present, by credit car or cash, to avoid confiscation of the vehicle. You may contest it after the event through legal channels. Fines may be paid at post offices Correos, branches of Santander and online here. You can also pay by phone, if you have good Spanish, by dailing 060 from within Spain. Motorists should be aware that some offences, such as drink driving, are considered criminal and carry much higher fines, as well as vehicle confiscation and even prison sentences. Your vehicle may be confiscated if it is discovered to have mechanical defects, if it produces excess noise or pollution, if it is not insured or because the driver refuses to pay a fine, or is under the influence of alcohol or drugs. The Guardia Civil now also have the power to seize your car if you are carrying children without legally compliant child seats. Be warned that you may well encounter some pretty spectacularly cheeky parking in the villages, towns and cities of Spain. It can feel a little bit like the Wild West at times and finding on-street parking in Granada City is almost impossible for the uninitiated and you would be wiser to head straight for one of the many public car parks. For more details on finding these visit our parking page which gives details of some of the most convenient and easy to access car parks in the city. Parking fees and time limits vary from town to town. Look out for the Zona Azul signs and blue Pay and Display ticket machines. You can usually park in these zones for up to two hours. Do check on machines and signage for information on time limits and the hours during which they apply. Generally payment will be required between 09.00 and 14.00 and from 16.00 until 21.00, Mondays to Fridays, and from 09.30 until 14.00 on Saturdays. 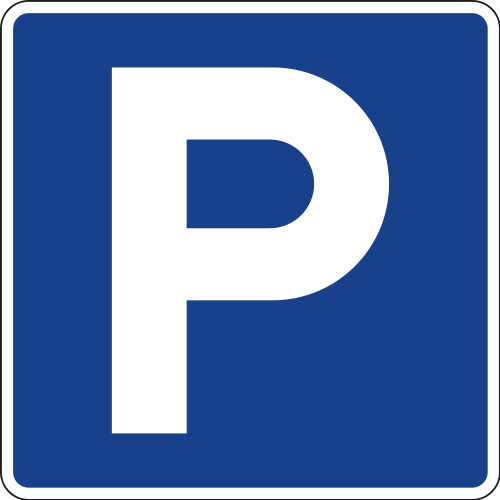 Parking is commonly free on Sundays and public holidays. If you do go over the time stated on your ticket there is sometimes the option to avoid a fine by buying an on-the-spot penalty ticket from the ticket machine. This should either be posted back into the ticket machine through a slot or displayed in your windscreen. Be aware that this option will only be available within a limited window of time. Foreign disabled permits are recognised in Spain and must be displayed clearly in the windscreen. Do not be surprised if you occasionally find a bread van parked in a disabled parking bay, or anywhere else that is inconvenient to other road users for that matter. The Pan Man seems to be a law unto himself in Spain. ‘Vado permanante’ means NO PARKING or KEEP CLEAR at all times. Any vehicle, whether registered in Spain or elsewhere, even your hire car, may be towed away by the Police if it is found to be illegally parked. To retrieve your car in such a situation you must go to the nearest police station where you will have to pay a parking fine, plus towing costs and a parking fee for the time during which the vehicle was impounded. In recent years great improvements have been made to the Spanish road network. La crisis has bought some projects to standstill, however, generally the motorways are in good condition and fairly uncongested away from the major cities. To check road and driving conditions visit the DGT website or tune into local radio stations. For Granada try Canal Sur Radio. If you want to find routes and calculate drives times click here for a map indicating the major destinations in Granada Province including airports. Most Spanish roads, and all roads in Granada Province, are toll-free. However, large sections of motorway are tolled, and they are not cheap, but you can generally find an alternative free route. Do be aware that there will be more congestion on free roads. Toll road numbers are prefixed with the letters AP and toll free roads with the letter E. You can check the routes that require toll payment on the ASETA website. Tolls are paid on the road in cash, by credit card or via an electronic payment system Telepeaje which requires installation of a transmitting device in the car which can be bought from banks and petrol stations. There are many services areas along the Spanish motorways selling unleaded sin plomo 98 or Eurosuper 95. Diesel is known as gasoleo. Be aware that there is a difference between Zona de Servicio (this will take you off the motorway to an area where you will find services such as restaurants, hotels, shops, petrol stations – gasolinera) and regular motorway Service Stations. A good rule of thumb, unless you are running on empty, is stop for a fill-up only when you can actually see the gasolinera from the road. To check the location of petrol stations on Spanish roads and get information on fuel prices visit this Government site. For more information on driving in Europe check out the RAC website. * Flashing from oncoming vehicles can be a warning of a speed trap ahead. OR the driver may be indicating to you that it is his right of way – unlike the way that motorists will flash to ‘let you out’ in the UK. * Similarly, but conversely, Spanish drivers will use their outside indicator to give you right of way if for example there is only room for one-way traffic on a narrow bridge or a road with with parked cars. Rather than it being a signal that they are moving out it is a signal that they are waiting for you. * Always use your lights in tunnels no matter how well-lit or fleetingly short they may seem to you. The Police are very hot on this. * When driving in rural areas, like La Alpujarra, fill-up when you can. The distances between gasolineras can be long and winding. * ‘Cambio Sentido’ on a dual or single carriage means that the opportunity is coming up to change direction. This could be via an overpass or underpass or a simple turning area.